Here is a brief walkthrough of how Encrypted LVM works on boot. The /boot partition is mounted. 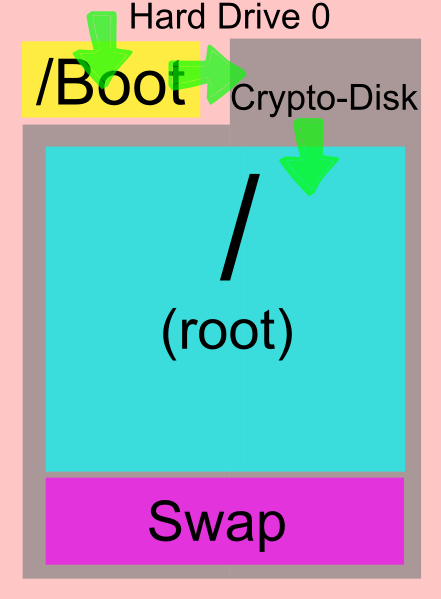 The /boot partition attempts to mount the physical volume for encryption (crypto-disk). The system asks the user for their password. Upon entering a successful password, the Logical Volume Manager takes over and mounts the / (root) and swap partitions. The system continues the boot process. When the system is shut down, the filesystems are all unmounted. The root and swap partitions cannot be mounted/decrypted without the proper password, keeping your data secure.